Happy Holidays everyone! I’m extremely excited to be sharing this Christmas collaboration post with you all today because it was so much fun to shoot and I hope you all enjoy it! 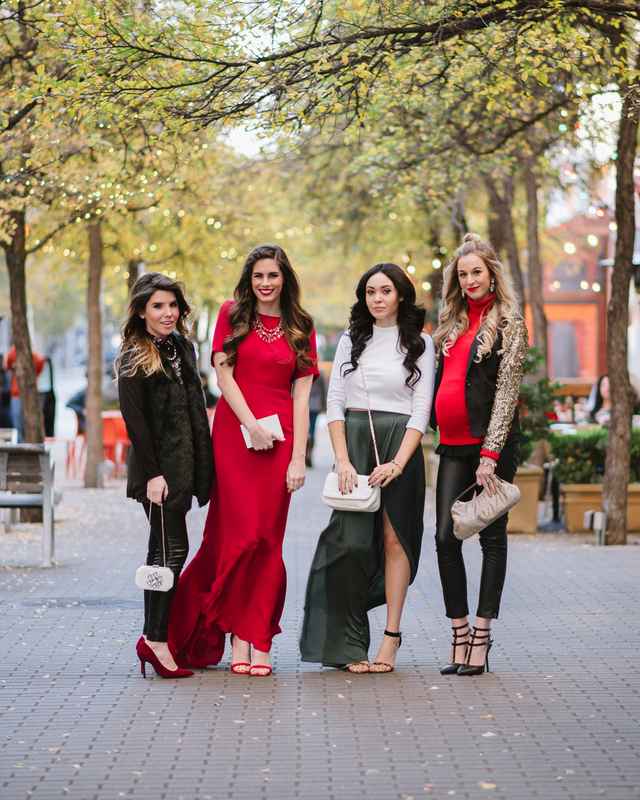 Hilary, Jonie, Sylvia, and I are getting you holiday-ready with these four Christmas looks that will definitely “WOW” at your upcoming fancy party! Thanks to our amazing photographer, Carlos Barron for capturing these incredible pictures. Check out his work here! 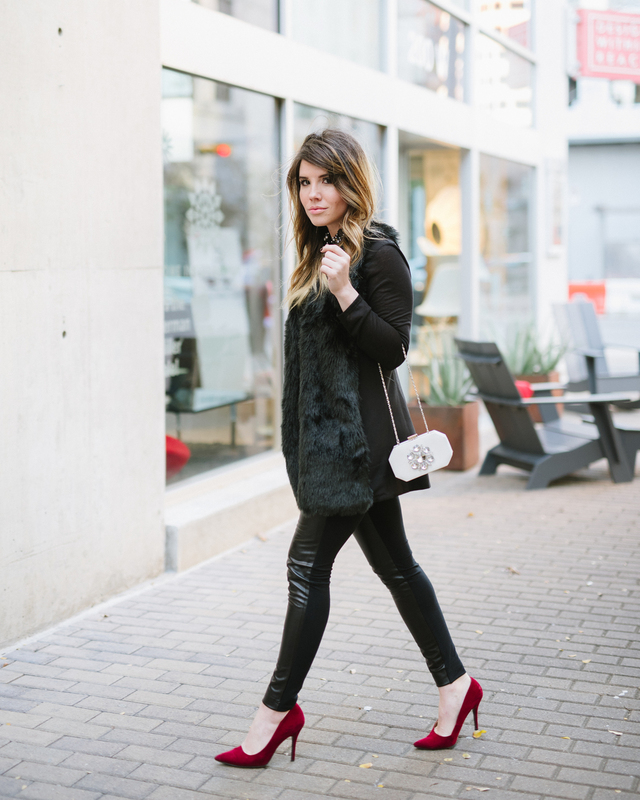 A little about my outfit: I wore black leather leggings and my favorite black studded heels. I’m 30 weeks pregnant this week and I felt great while we were shooting. I had a lot of energy (probably from the margherita pizza I had just stuffed my face with) and had so much fun! The next day I have to admit I was hurting a bit, but hey- it was all in good fun for the holidays haha. I am wearing a non-maternity red turtleneck sweater and this black FHJ Baby ruffled belly band which is incredible! From the back of my closet I pulled out this sequined blazer that I thought was super festive, and I linked some similar ones below. I have been really loving red lipstick lately, and of course it’s Christmas time so I am going to take full advantage of rocking that! Erin Noel of PRIV did my hair and I wish she could do it everyday, and Laurie rocked my makeup (check out their Instagram handles below). If you want to shop my outfit, I have everything linked below, and if you want to shop any of the other girls’ looks head over to their blogs, which I linked up top! Thanks for stopping by to read and I would love to hear your comments and see your likes on this post! Use my code PLATINUM to receive a discount at checkout on a pair of your own set of extensions! I’ve had mine for an entire year and they are still going strong! Fashion is one of the addictive things and no one says no to it. The maxi you have worn in that picture is so amazing and color of that outfit is also astounding plus eye catching. The color of your sandal is also good and I wish your friend good luck for her upcoming baby.